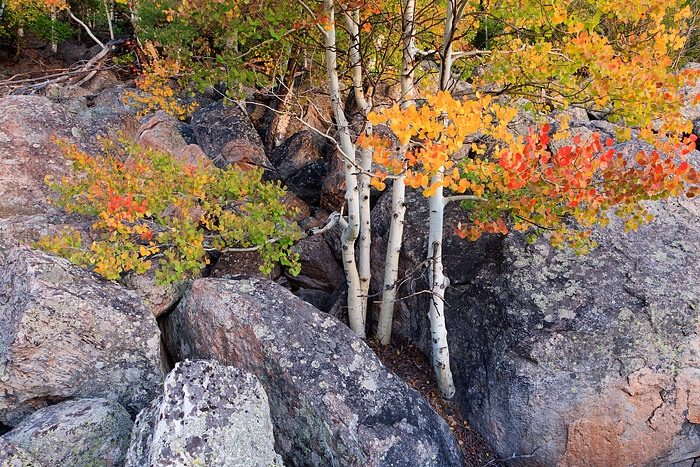 Four aspen boles placed amongst a hillside of large boulders help to produce an amazing aray of fall color. Golden yellow, orange, some green and blazing red Aspen leaves make these stands of Aspen trees look like they are on fire. The area in and around Bear Lake Road in Rocky Mountain National Park is one of the better locations in Rocky Mountain to view the Park's Aspen groves during peak fall color which typically occurs during the last week of September. Photo © copyright by Thomas Mangan.